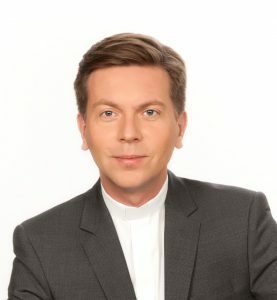 born on 5 March 1975 in Vienna, Priest of the Diocese of Eisenstadt from 29 June 2000, Rector of the Austrian Hospice of the Holy Family in Jerusalem since 27 April 2004. Commander of the Order of the Knights of the Holy Sepulchre of Jerusalem; Spiritual Counsel of the St. George Order of the House of Habsburg-Lorraine; member of the Roman Student Fraternity Capitolina and the KÖL Leopoldina in Vienna. Honorary Professor at the Philosophical-Theological College Benedict XVI. in Heiligenkreuz, graduate of the Strategic Leadership Course of the Austrian Federal Government at the National Defence Academy. Silver medal for services to the Republic of Austria 2015; Highest Decoration of the Province of Burgenland in October 2016; awarded golden mark of merit of the Province of Upper Austria on 29 November 2016 and Tyrolean Eagle Order in gold on 8 November 2018. Studied Catholic Theology and Religious Education at the University of Vienna and at the Benedictine (Dormition) Abbey Hagia Maria Sion in Jerusalem. September 2000 to August 2001 Chaplain in Mattersburg, Walbersdorf and Pöttelsdorf (Bgld.). 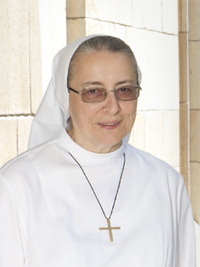 September 2001 – February 2004 studied at the École biblique et archéologique française de Jérusalem. born 24 November 1948 at Schloss Brunnwald / Vorderweissenbach, 1970 ordained Sister of the Cross, from 1971 to 1998 provincial bursar in the province of Upper Austria-Salzburg, from 1999 to 2008 procurator in the Benedictine Dormition Abbey in Jerusalem. Since 1 March 2008 in charge of house management; appointed Deputy Rector of the Austrian Hospice of the Holy Family on 1 September 2011. Golden mark of merit of the country Upper Austria on 25 November 2013; awarded golden mark of merit of the Republic of Austria 2016, Tyrolean Eagle Order in gold on 8 November 2018.